Cosmic Journeys has released the latest in their very popular science series. 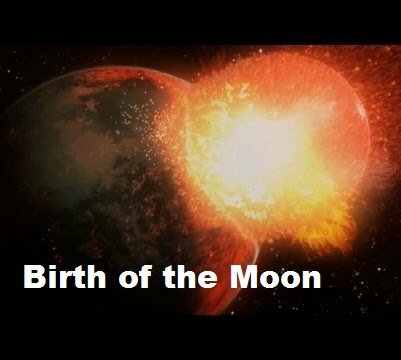 BIRTH OF THE MOON tells the story of how Earth’s moon came to be. There are conflicting theories and violent, mysterious evidence left over from an earlier age. Shot in gorgeous HD 1080p. 25 minutes long.By scouring the surface, making maps, traversing the craters, and digging into the crust, Cosmic Journeys sheds light on the darkside of the moon. Many years ago, humans sent men into space with the goal of walking on the moon. It was a symbol of our might, our perseverance, and of America’s perceived dominance over the USSR. It was a giant leap for mankind – but, it may have also been a giant leap for the moon and its untold story. The astronauts of Apollo brought home many rocks, soil, and dust form the moon. Scientists got to work in the laboratories and probed these rocks for clues. Could this be evidence towards figuring out how the moon was formed? What was the nature of the heavens, and how did the world of men fit within it? Sibrel believes that there were numerous insurmountable scientific and technical problems which made it improbable that men could land on the moon and return to Earth safely. Each of us, in the immortal words of the American poet Walt Whitman, “…are the journeywork of the stars, no less than the leaves of grass.” As Carl Sagan would put it later in the twentieth century – “Our lives, our past and our future are tied to the sun, the moon and the stars… We humans have seen the atoms which constitute all of nature and the forces that sculpted this work… and we, who embody the local eyes and ears and thoughts and feelings of the cosmos, have begun to wonder about our origins… star stuff contemplating the stars, organized collections of ten billion billion billion atoms, contemplating the evolution of nature, tracing that long path by which it arrived at consciousness here on the planet earth… Our loyalties are to the species and to the planet. Our Solar System has a mysterious zone that holds the clue to our origins. NASA has been trying since 2006 to gain access to this zone aboard the biggest rocket yet.